Mental Description: He is a "Typical Overconfindent HotHead" and he wants to stop Gh0st because it sound like fun. 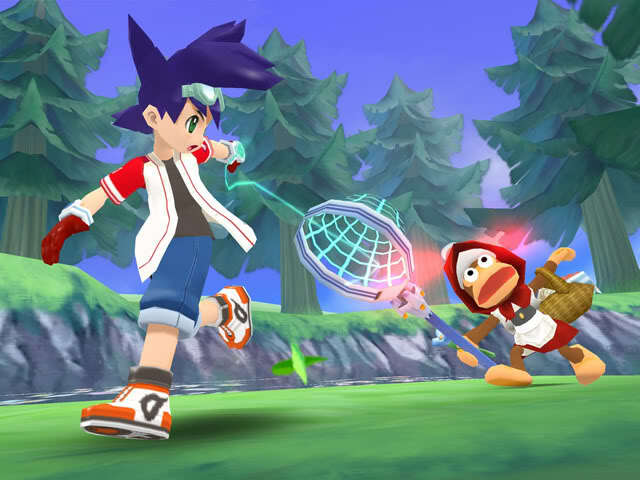 Storyline: In Ape Escape 3, He is Yumi's brother. They are supposedly twins, given that they are both in the fourth grade. Their aunt, Aki, provides the siblings with new Gadgets and Morphs. After the Events of A.E. H.O.T.D., Kei decides that he will join the AMS simpily because it sounds like fun. But he never ahd a clue that he had to go to an academy to do so. Unknowingly, Aki enrolles Kei and Yumi into the AMS Academy without their own say in the matter. In walking into the acedemy he and Yumi Immediately are underestamatied. A few years passes, he graducates allow with Yumi at the top of their class, leaving the rest of the students and teachers awestruck. Following this, he and Yumi are called when serious outbreaks occur. Also, Kei has saved the world three times. 2) Powers and abilities: He has the ability to Transform Kei's transformations include the Fantasy Knight, Wild West Kid, Miracle Ninja, Genie Dancer, Dragon Kung Fu Fighter, Cyber Ace, and Super Monkey. Aki is creating new morphs to benfit his new job. 3) Monologue: Kei is walking down the hallways of the AMS HQ. He has just been called on a mission, a serious mission. The dude in charge of the AMS called him by the Aki-Phone during Baseball practice. "What a jerk!" Aki said folding his arms, and still walking. "He knows I have baseball practice from 4:00 to 5:00! He called me by 4:25!" Kei put his arms back down. "Well look at the bright side this will just give me more worldly fame." Kei put his hands behind his back. "More fame for me." He reached the office door, slowly put his arm down, and sat on the chair in front of the work desk. 4) How often will you be onliine: Everyday inless Aki takes the computer or I go on http://freeplace.forumotion.com. 5) Do you agree with the RP rules: Yeah I do, no problem. Intriguing a character from an alternate game... Accepted... seems hard to believe but I guess we could find a way for you to fit into the HotD universe. Welcome to the RP.